Email Marketing can be simple, affordable and effective, which is why many small businesses decide to use this channel to launch their first marketing campaign. According to the Direct Marketing Association, businesses made on average $40 for every $1 spent on email marketing in 2011. Here are 7 steps to help you launch your first email marketing campaign. Why are you sending this email? Is it to educate users? Announce an event? Promote a product? Who is your audience? Are you sending to all your customers or just a subset? What do you want your reader to do? What is your call to action? Why should a reader take the action you are asking them to do? Defining clear objectives and how you are going to measure the success of a campaign will make your campaign more effective. Choosing the right Email Service Provider (ESP) is among the first things you must do to launch a successful email marketing campaign. We strongly recommend that you do not use Gmail, Outlook, Hotmail or another email platform to send bulk emails. Companies such as Constant Contact, Mad Mimi or Mail Chimp offer a way to send bulk emails as well as create and manage your email database, campaign management services as well as customizable email templates. Many of these ESPs offer a free trial or freemium model based on list size so you can decide which one is right for you. Another option is to use a self-service tool, which are very intuitive and often provide free support and tutorials to guide you through your first campaign set up. Set up a database with the email addresses of all your existing and potential customers. With all ESPs, you should be able to add an “email sign up” form to your website that will automatically link to your email database. Email frequency (e.g. Up to two emails a month). If they get something free in return for their email address (e.g. A free catalog!). Only add email addresses to your database, you have permission to email them. For example, people who have purchased from you and given their email address in order to purchase have opted-in to receiving communications from you. In fact, you may want to consider including an email sign up as part of your registration process, or customer purchasing flow, to further grow your database. 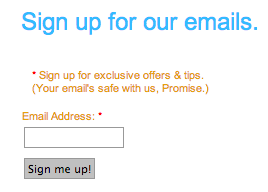 Include an unsubscribe link in all emails (see below). Unsubscribe a user within 10 working days of someone requesting to be unsubscribed. However, we recommend unsubscribing people immediately. Marketing emails must include a physical address. Strong subject line – Your subject line must tell a user why they should open your email, communicating a benefit for them – a reason to open. Make sure your subject line is compelling, clear and actionable. An attention grabbing headline – Capture your recipients attention with a catchy headline that will make them want to read on further. 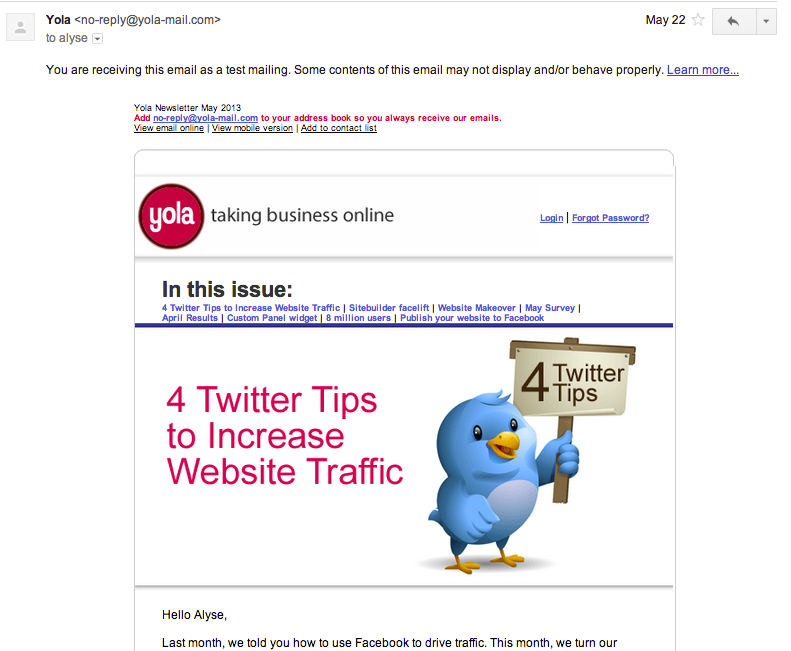 Good text/image ratio – Make sure the email contains a mixture of text and images. Although, an email made from one image may look very visually appealing, it won’t look good when images are disabled in the readers inbox and the recipient won’t know what the email is about until they have enabled images. When you use image be sure to include the alt tag descriptions. This way if your images don’t render immediately, then a user will know what they spaces are. Your logo – A logo will make your email recognizable to the recipient as they will have seen it before when visiting your site and will therefore know the email is legitimate. 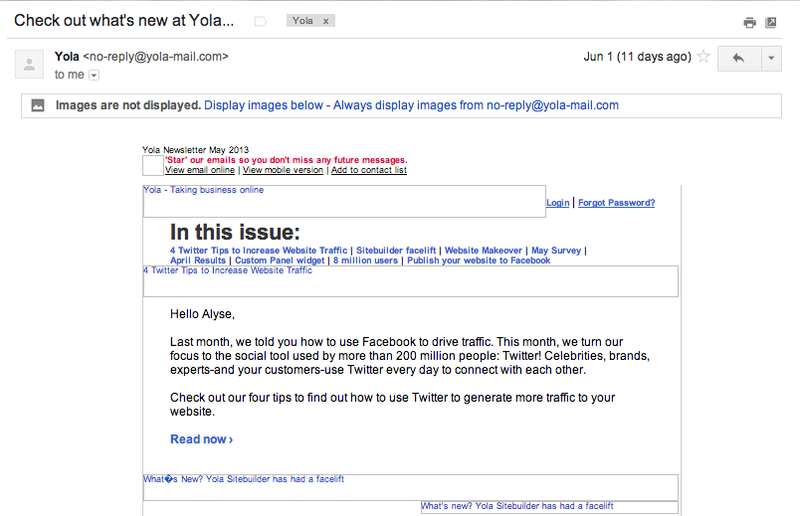 Personalization – Try and personalize your email to each recipient. For starters, use their name in the subject line and/or email copy. Using someone’s name in the subject line have open rates about 4.7% over the average. Your address – Be sure to include your business address at the bottom of any emails you send. Unsubscribe link – There must be a way for your email recipients to opt out of receiving marketing emails. All ESPs will have the functionality to add an unsubscribe link at the bottom of your email and will stop you from sending those users more marketing emails in the future. How many downloads of a document. In a previous post, we talked about the top 10 email marketing metric basics and outline different data points you can use to gauge the success of your campaign.